Solar photovoltaic modules require cover glass to protect them from the elements. These glass and clear plastic (EVA) layers in the path between the cell and the sun alter reflectance and absorption properties, creating what are known as cell-to-module (CTM) effects. The light that reaches cells in a finished (encapsulated) solar module thus differs from what a bare solar cell sees. The problem manufacturers face is that adjustments for bare cells may not achieve the desired efficiency results after encapsulation in a module, even for the very same cells. 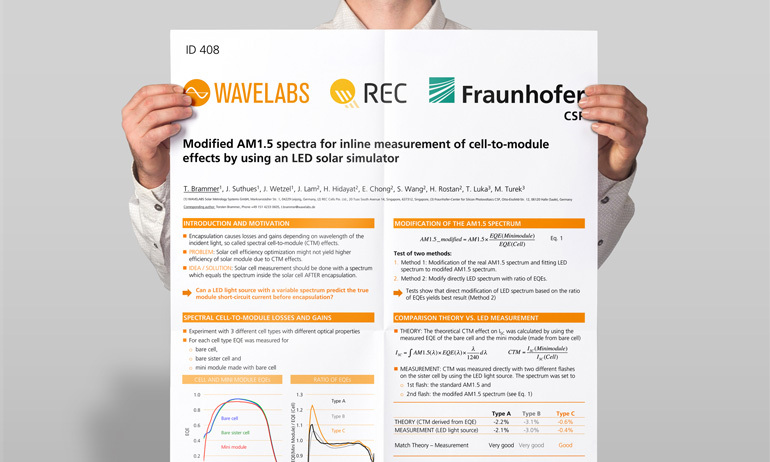 WAVELABS has in cooperation with REC and Fraunhofer CSP developed a solution: why not take advantage of the flexible spectrum a 21-color-channel WAVELABS LED solar simulator can generate and optimize cells using the same spectrum they will see after encapsulation? The results of this joint experiment revealed that theoretical cell-to-module effects closely matched actual results obtained by modifying ATM1.5 spectrum to simulate encapsulation. For a summary of the results, view our poster (ID 408) here or simply visit us at booth E3-550 (Suzhou Jsuntronic) at SNEC.